We are very sad to be saying goodbye to our colleague and friend Zoë Carassik-Lord who leaves Sound Connections at the end of March to join Pie Factory Music in Ramsgate. 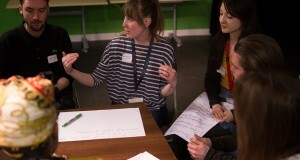 A truly passionate advocate for music education, over the last few years Zoë has brilliantly led KS3 music networks Teach Through Music and Music Excellence London, supported the Challenging Circumstances Music Network, and brought her wisdom and insights to Sound Connections research. Her fighting spirit has also seen her outside and inside parliament championing inclusion of creative subjects in the national curriculum, alongside colleagues from the Bacc for the Future campaign. We wish Zoë, her husband Simon and her cheeky pup Mo all the very best with their move to the seaside.